Fighting bad guys is an expected vocation for a superhero. So how could there possibly be real estate superheroes who serve Molalla? And would they use x-ray glasses to view inside homes to find potential problems, carry an anti-kryptonite pen to protect against real estate ‘evil doers,’ or hold their trusty multiple listing lockbox keycard in a utility belt? If you’re a Molalla homebuyer, you can add certain challenging homeseller attititudes to the potential list of transaction implosions. If you’re a Molalla homeseller, you might include certain ham-fisted home buyer attitudes. The bottom line is that in order to deal with a multiplicity of potentially detrimental factors affecting your home purchase or sale, it’s clearly best to be prepared. And when you’re knee deep in transaction challenges, that’s not the time to wish you were working with someone more qualified. But what differentiates a Molalla area real estate superhero from other real estate agents? Here are a few examples. Another key benefit to working with a CRS Realtor is their networking advantage. 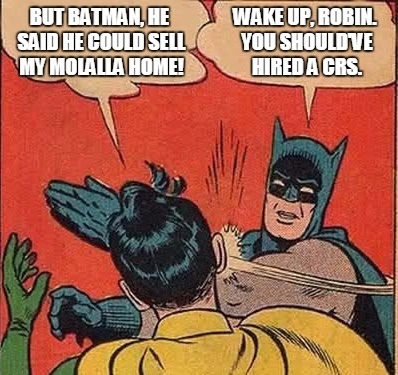 So whether you expect to buy or sell in Molalla, elsewhere in Oregon, or if you’ll have a real estate transaction in another state, the CRS referral network is a proven way for you to connect with another ‘high caliber’ Realtor who holds the CRS designation. The CRS organization has an entire system devoted to a virtually seamless referral system for buyers and sellers who seek a super Certified Residential Specialist Realtor. For example, I recently received a phone call from an Idaho CRS agent working with Oregon buyers. These buyers found their ‘perfect’ Idaho home and needed to sell their home in order to purchase the Idaho property. The Idaho CRS Realtor suggested they work with a local CRS agent to most effectively sell their Willamette Valley home. Mere minutes upon receiving a phone call from the Idaho CRS agent, I was in contact with these homeowners, then proceeded to list and successfully sell their property, all in short order. To most Molalla area homebuyers and homesellers, one key to a Realtor’s stellar real estate performance is consistent performance. Another is experience. Yet one more is education. The advantage to you as a homebuyer or homeseller in working with a CRS Realtor is that you get the entire bundle of keys and reduce your chances of being ‘locked out’ in your next transaction. This entry was posted in Find A Molalla Realtor, Finding A Molalla Realtor, Molalla, Molalla Homes, Molalla Homeseller, Molalla Homeselling, Molalla Housing, Molalla Oregon, Molalla Oregon Homes, Molalla Oregon Properties, Molalla Oregon Real Estate, Molalla Oregon Realty, Molalla Properties, Molalla Real Estate, Molalla Real Estate Agent, Molalla Realty and tagged 97038, Find A Molalla Realtor, Finding A Molalla Real Estate Agent, Molalla, Molalla Homes, Molalla Homeselling, Molalla Housing, Molalla Oregon, Molalla Oregon Homes, Molalla Oregon Properties, Molalla Oregon Property, Molalla Oregon Real Estate, Molalla Oregon Realty, Molalla Property, Molalla Real Estate, Molalla Realty. Bookmark the permalink.